Once again I find myself coming into school on a Saturday, but after getting a Monday off (and looking forward to another Monday free) it’s really just like having a five day work week. Also, including yesterday, the actual work among the teachers is pretty minimal as once again it’s mostly in the hands of the students to get everything done. Although, instead of finding myself outside working out on a bright sunny day, I found myself inside playing on a rainy humid day. Yes, in fact, it was the antithesis to sports day. If last week was for the brawn, this would be for the brains. It was: Culture and Arts Day. Again, I’m astonished, not quite this time at the amount of work the students have put in, but more at the amount of school time devoted to these events. Coming from a country where most public schools have been eliminating Arts and music courses across the board and even argue against recess, it’s relieving to see that at least some of the world’s youth get a chance. It starts on Friday with about two hours in the morning where each class, of twenty-three total, received two canvases (about 3×5 feet) and in groups painted a mural. At first it seemed like such a short time, but as I wandered among the halls and classrooms checking out the classes, the students were well at recreating a smaller sketch they’d already decided on. I don’t know if there is some larger life symbolism because they made almost exact replicas of their tinier murals, but on a whole it seemed pretty simple work for them. 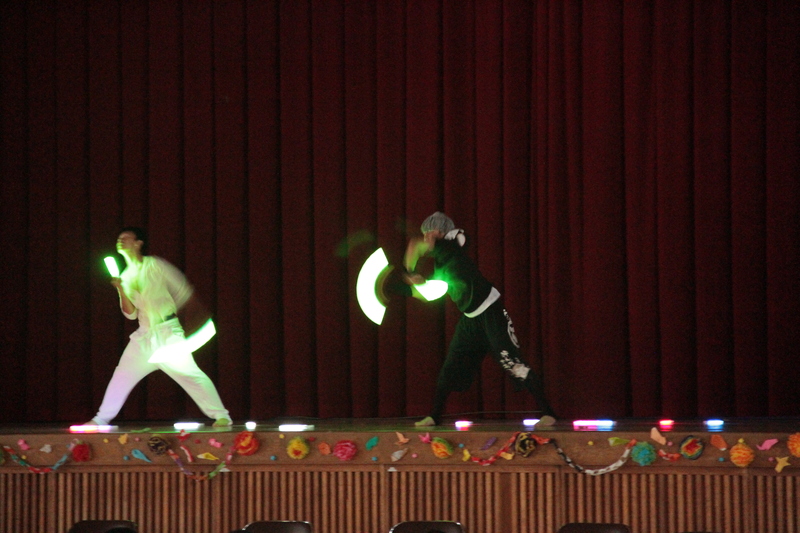 After that we had an assembly in the gym, where the student organizers took center stage and performed various skits. They even introduced some video where they pulled pranks on various teachers, and it was all interactive and pretty awesome. 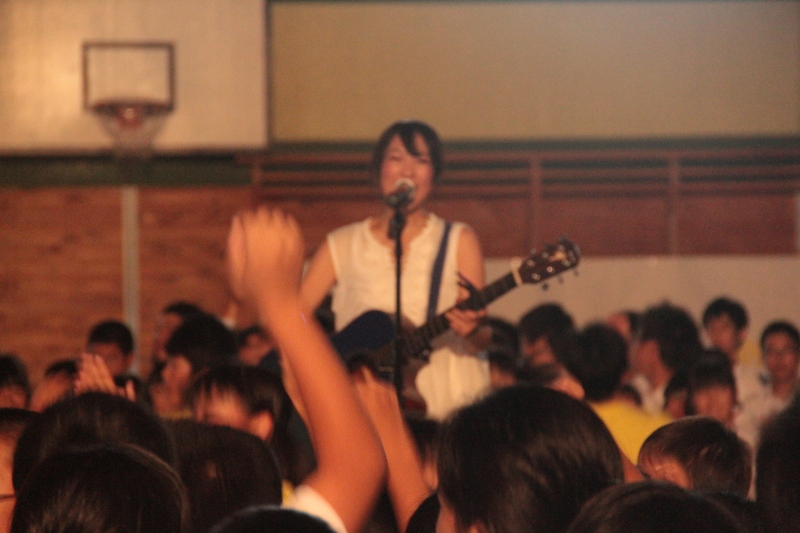 In the end, they even incorporated the skit with the main act of the day: a performance by a local singer, Seri Kana, who graduated from the school. It was all quite the production and pretty exciting, especially for the students, and it offered a different look at their behavior. The level after that basically continued all day, as lunch was served out of the classrooms pseudo county fair style. All the third year classes were responsible for transforming their classrooms into food-stall-cafe where students could order food via tickets they purchased. Early in the week to save money for the holiday (and overall scrounging) I decided not to buy any tickets and I was kind of regretting the choice now. I still got to share some bites offered from the kids, and it was just an experience to see it all happen on the bottom hallway of our school. I’ve been told these two weeks are the greatest of the year, and I can see why. This whole time I’ve felt like I did back in my summer daycare, some of the fondest nostalgia I can muster, where you’ve got the freedom of summer but the community of school. It’s really a happy feeling. After that I grouped up with what can now be called my favorite class: a group of second years with a good amount of rowdiness, but enough English effort to make them admirable. Granted I’m not trying to get into favorites so early, I knew eventually it would happen, but it seems less of my favoring them and more them favoring me. So, after teaming up with them during the talent show, I got dragged around to each classroom on the second floor where the first years were putting on various games and activities for the rest of the day. Imagine each room getting turned into a thirteen year old’s capacity for a Japanese game show using only cardboard and duct tape and your practically there. We had bowling with plastic bottles as pins, basketball shots with newspaper balls, and skee ball with super balls and paper cups (and those are just the easiest to describe). Altogether I’m not quite sure what this day was about, but maybe it was just a retainer for the amount of lackluster the following day would inhabit. Not to say that Saturday was all bad. Although, imagine being a parent of a seventh grader (maybe you are), and then going to their school choir concert because after all you’re their parent and you sort of have to because it’s on a Saturday and you know, their cute when they’re up there because they’re terrible singers but they try anyway so you can sort of enjoy it. OK, you got that in your mind? Now imagine that, after you kid gets back from the front of the stage, another group goes up, and then another, and just for good measure imagine that they’re speaking in Swahili, a language that you really don’t understand but can chime in every time someone says Asante sana (but really, that only makes you think ‘squashed banana’ and then as you imagine Zazu singing that to Scar in the Lion King you realize that you’re supposed to be watching some school choir concert that you haven’t been paying attention to for the past half hour). 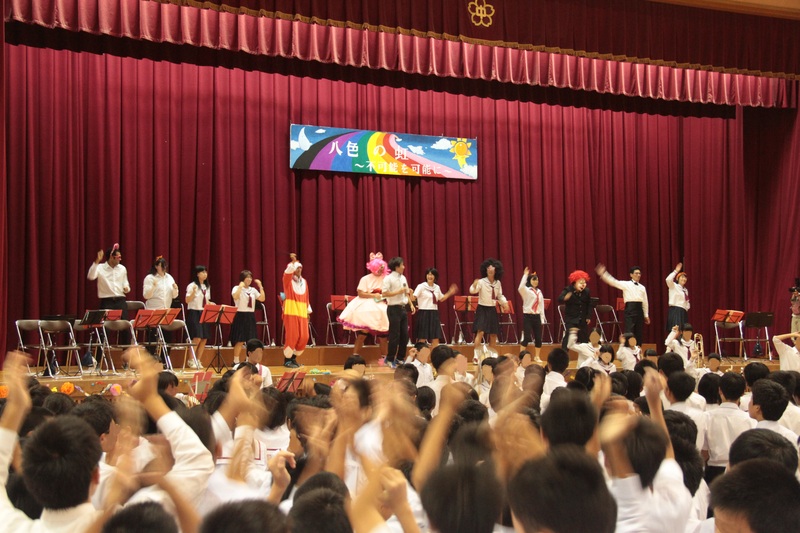 There was a slight intermission in which the school band set up shop in front of the stage and I with Coral, the other ALT, and several teachers got up and danced to a song that is known for its origins in parody and antics (for good measure, it’s called てぃてぃてぃてれっててれてぃてぃてぃ). We’d stayed until 7:30 the night before trying to learn the dance, and on my part it was a slight–but hilarious and thus successful–failure. Incredibly, once we left Friday night it seemed that we might even be some of the first to leave (that’s even including the students). At first I was eager to do it because I wanted to feel involved with the students, but after it really highlighted my involvement among the teachers. I got to talk with some I hadn’t met before, and really became friendlier with a couple I’d already favored. Honestly, even with the silly dancing, one of the most amusing parts of the day was to be sitting on the sidelines and watch as the students (who brought their classroom chairs into the gym) slowly drooped their heads and closed their eyes and tried to keep their neck from dropping lest the nearest teacher slowly approach them and make sure their friends knew they were asleep in a bright red blush of embarrassment as they finally snapped back to attention only to repeat the process in another five minutes. It was quite the spectacle in spite of its subtlety. That night, like last week, once everything was done and cleaned up, we had another work party within walking distance to the school at a Chinese restaurant. I’d consider this one even better, perhaps because the teachers weren’t fatigued from the sun and cheering of Sports day, or maybe just because I’d gotten a little more closer to each of them. Still, this time through a random process, I sat next to my advisor and Coral, which I didn’t mind too much despite wanting to get away for English. It wasn’t long before Coral got up and started commiserating, and my advisor got up in search of more beer. There’s this great, albeit dangerous, tradition in Japan that you don’t fill up your own drinking glass, and thus everyone around must tend to its fullness out of respect. It really helps drive everyone to drink, but also muddles with keeping track of how much you’ve actually had. Eventually I was probably buzzed, but I don’t think I had nearly enough to get tipsy. When it was time to leave, though, I still wanted to rally and enjoy the night. Even though it was closing on close to eleven, I remember getting back so early last time and wanting to go out. A group of teachers, only one of which, another twenty-three year old guy, was an English teacher, decided to go out to nearby karaoke. (I put that in italics because the conditions of karaoke in Japan are pretty unique and they pronounce it ka (like car)- row (like had a row)-oh-kay.) In the end their were eight of us: the English teacher and me, a now devious duo, two teachers I’d yet to even hear speak (one of which sang metal), two teachers who I’d marked as the best dressed (one of which made me sing Bon Jovi and the other who loved Bill Withers), and the schools two music teachers (both of which trumped any other karaoke performance I’ve ever heard). I got back to my place a little after one thanks to the graciousness of another English teacher who picked us up. Ready to start my weekend, and procrastinate on planning my Tokyo trip. I went to the bus station today thanks to another ALT and his Portuguese girlfriend who speaks native Japanese fluently, but they had already sold out of bus tickets (presumably because it was a special weekend) so I’m kind of in the zone to wing it. I guess we’ll see. Posted in School, Students.Tagged interactions, karaoke, school event, students.